CFD: Computational Fluid Dynamics Or Colorful Fluid Dynamics? Queen’s immortal Bohemian Rhapsody asks a question that can directly apply to mathematical models: How do we know that numerical models are true? How do we know that they are defensible? More importantly, how can a modeler convey to customers the care he or she put into the model itself? Those questions are important to the water industry, where leading companies are making better use of sophisticated models every day. 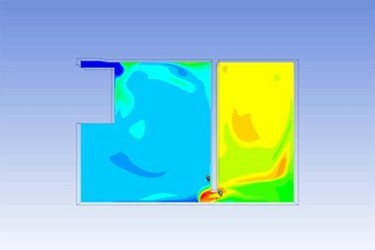 Computational Fluid Dynamics (CFD) was once exclusive to the aerospace and automobile industries. That is no longer the case. Today, CFD is literally changing the shape of water management facilities and equipment. Water and wastewater treatment plants are typically designed from a purely civil engineering perspective, with primary focus on hydraulics and infrastructure, and not as much focus on treatment processes. As plant design evolved, plant operators and engineers noticed that some components of the treatment train, while structurally and hydraulically sound, often fell short of treatment goals. It became widely evident that common phenomena such as short-circuiting, dead zones and thermal currents were not accounted for in standard calculations. Tracer studies then became an invaluable tool for better understanding and improving volumetric efficiency. Simple basins gave way to more efficient serpentine designs. While these were huge steps in improving design, many variables were still unaddressed by early analytical tools. In particular, multiphase flows, gas/water interactions like those seen in almost every wastewater or water treatment process — specifically in aeration, activated sludge, disinfection and in primary and secondary clarifiers — were not understood or correctly accounted for. Neither were the complex phenomena of chemical species transport, reaction kinetics and mass transfer.